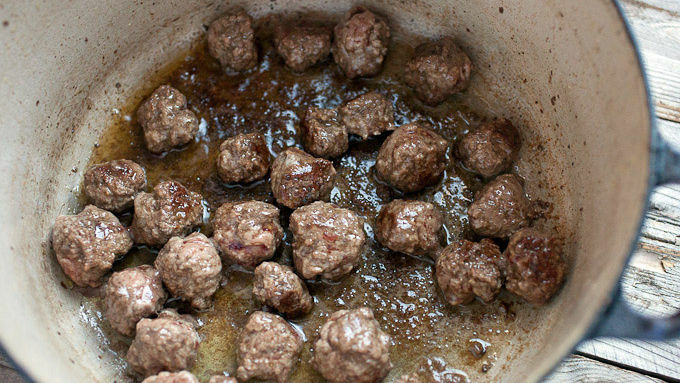 Roll beef into very small meatballs. You should get 25-30 out of the pound. Heat oil in a large sturdy pot over medium heat. Add meatballs and brown well on all sides, cooking for 5-6 minutes. 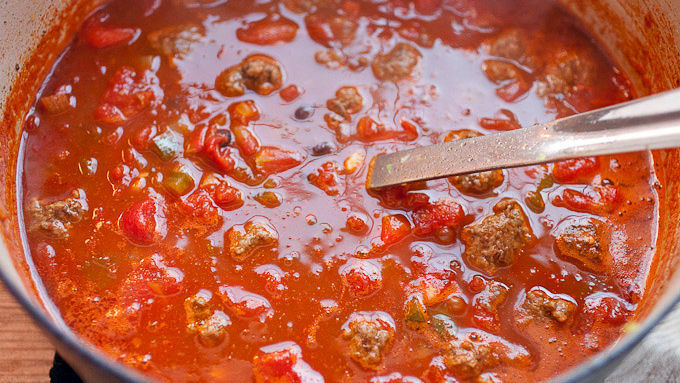 Remove meatballs from pot and add onions, green peppers and jalapenos. Cook for 3-4 minutes, until veggies are softened. 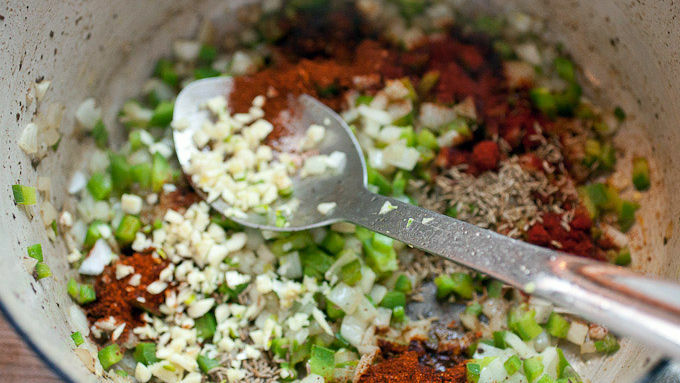 Add garlic, chili powder, paprika, cumin, and tomato paste and stir together. Cook for 30 seconds. Add diced tomatoes and beef stock and bring to a simmer. Return meatballs to the chili, along with drained and rinsed beans. Simmer for 8-10 minutes. Taste and season with salt and pepper. Serve with a big handful of cheddar cheese on top, sour cream, and diced scallions. I like chili as much as the next red-blooded American, but I not how everything gets broken down into tiny pieces. 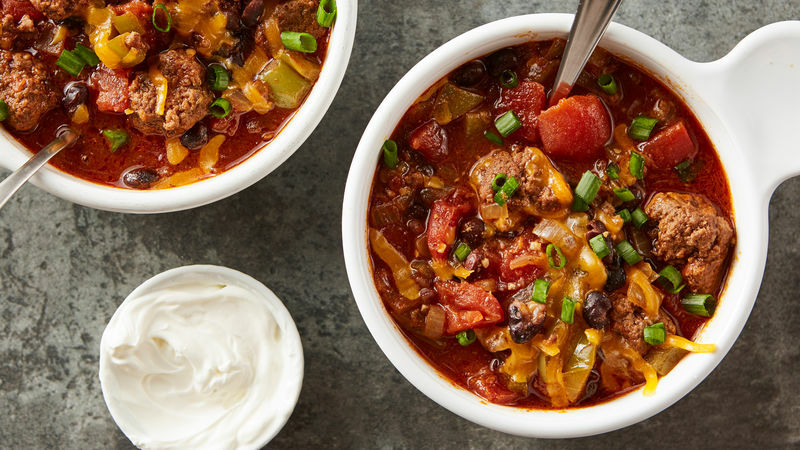 That’s why I love this chili recipe so much. Instead of just mashing up ground beef, I like to make little meatballs first. They hold together better and each bite is almost like eating a cheeseburger! Of course, making little meatballs is a bit more work, but it’s worth it. 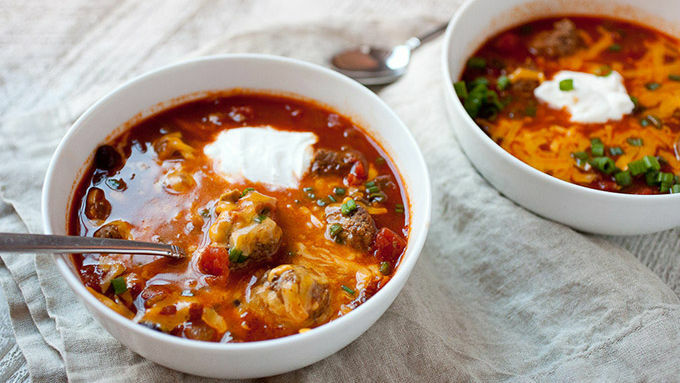 Spoon the chili up in bowls with lots of cheddar cheese, a dollop of sour cream and diced scallions. For 45 minutes of work, it doesn’t get much better than this for a warming winter meal!